Americans jump out to early lead, hold of Tulsa late to snap Oilers’ three-game road winning streak. 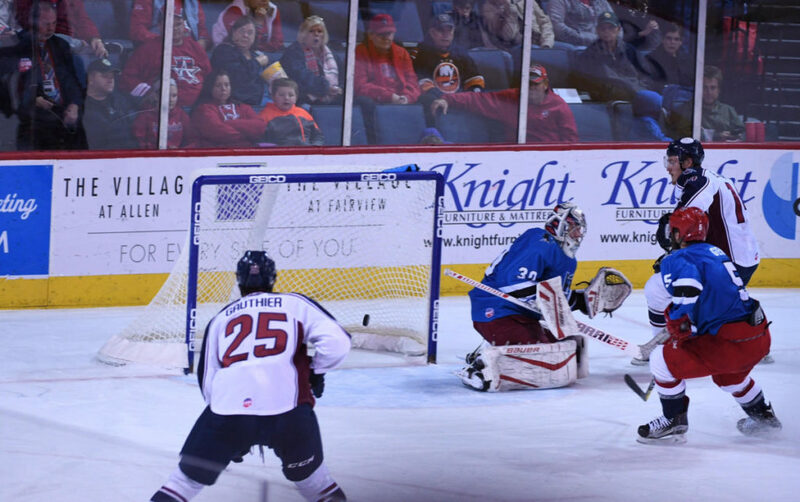 ALLEN, TX – The Allen Americans reversed the score from Friday’s game to defeat the Tulsa Oilers 4-2 Saturday at the Allen Event Center to split the weekend series between the two rivals. The Americans capitalized on a turnover, when Spencer Asuchak scored on a shot between the circles at 6:42 to break a scoreless tie. Allen received three first period power plays, and scored on the final one, when Gary Steffes tapped in a centering pass from Chad Costello, who assisted on both goals in the frame. The Oilers cut the deficit to one late in the second period, when Ben Murphy scored his third goal in the last five games with 4:09 left in the stanza. Jason Fram, however, fooled Oilers goaltender Colin Stevens with a wraparound goal with 1:38 left in the period to give Allen a 3-1 lead after two. Murphy added his second goal of the night with 5:49 left in the third to cut Allen’s lead to 3-2, but Bryan Moore blocked a Tulsa shot and took it the other way on a breakaway, before beating Stevens over the glove to give the Americans the 4-2 win. The Oilers have five days off before their next game Friday against the Missouri Mavericks at 7:05pm at the BOK Center. Tulsa will be wearing special National Wild Turkey Federation jerseys that will be auctioned off after the game in the OneOK Club on the concourse level. It will also be the Oilers’ annual Teddy Bear Toss game, which benefits the Salvation Army. Bring new teddy bears to donate and throw them on the ice after the first Oilers goal.